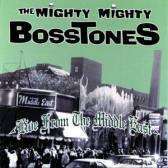 The Mighty Mighty Bosstones - Live From The Middle East 12"
Recorded live at The Middle East, Cambridge, MA by LiveWire Mobile. Mixed at Fort Apache Studios, Cambridge, MA. Black Friday 2015 Record Store Day Release in coloured vinyl. Limited to 1900 Clear Blue Vinyl (this one) and 100 random Red/Green Split Colored Vinyl, first time on vinyl, gatefold.